Unlimted Specialties specializes in both high quality outdoor mailboxes and indoor mailboxes and as well as free standing pedestal style and recessed wall mount style commercial mailboxes, which are offered and available to businesses & industries throughout the New England States. As a mailbox supplier and leader, we have been distributing our commercial mailboxes across New England for several decades. 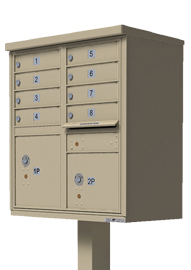 Our outdoor and indoor commercial mailboxes which are geared for centralized mail delivery are ideal for apartment complexes, condominiums, commercial retail strip malls, office buildings, military bases, universities, schools, commercial buildings, cities, government agencies, housing authorities, post offices, and postal stores.